BLACK FRIDAY, 2014 – the opening of OBSESSIONS at SPACE Gallery Pittsburgh. The work of six artists from across the country – artists who have never shown together – will be unveiled to the public. With print and collage works titled Trouble Every Day, Debt, and Human Alienation, Williamsport artist Jeremiah Johnson holds nothing back. Intimate moments are juxtaposed with pop culture references and hidden metaphors. 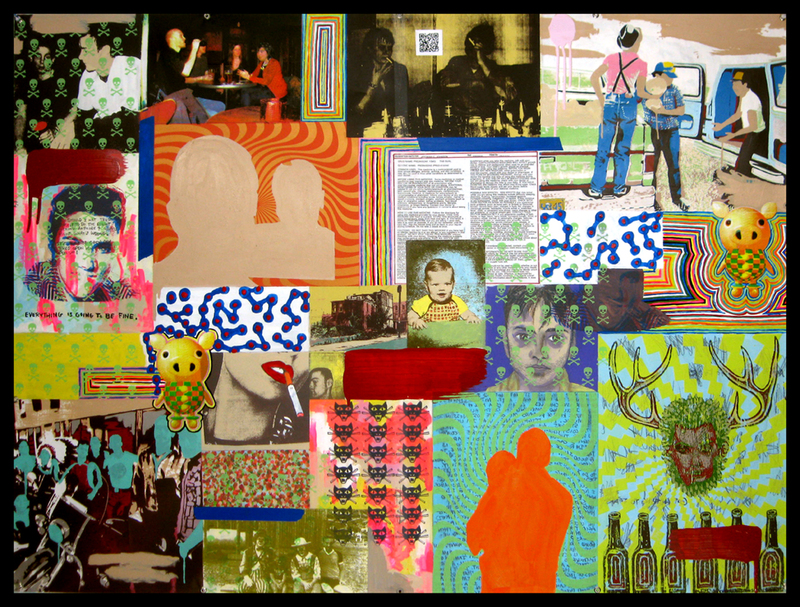 Johnson will be showing a mix of prints and richly layered 2-D mixed media works, filling the side walls of the gallery. If you’re a printmaking enthusiast, be sure to check out the techniques Johnson uses in his works, including screen printing, mono print, lithography and relief printing. PERFORMANCE ART – one gigantic wall of the gallery is dedicated to a performance piece by Becky Slemmons. Starting at 6 PM on the opening night of the exhibition, Slemmons will begin making over 9000 marks with brush and paint, ascending ladders up the fifteen foot walls. The piece is about obsessive love, and each mark will represent a day that she has been with her husband. Work will continue one the piece throughout gallery hours throughout the run of the show. PROCESS – Laurie Trok has been a busy in the Pittsburgh art scene over the past few years. I’ve been wanting to include her work in a group show since seeing her 2013 solo show at FE Gallery. 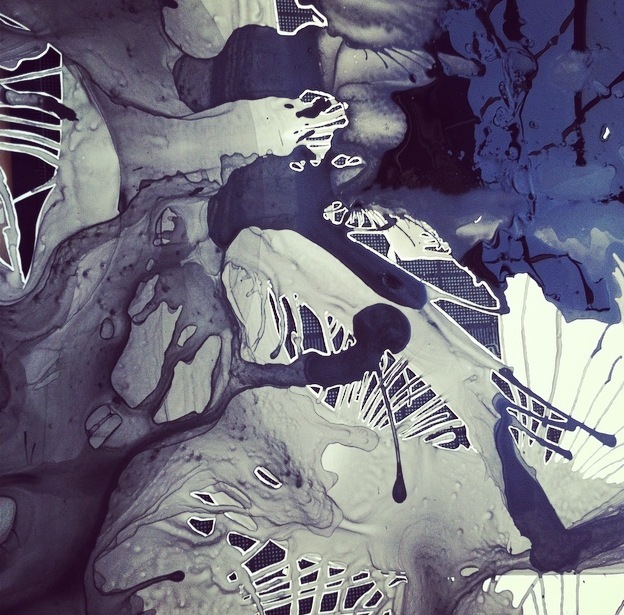 Trok will be showing an installation in ink and cut paper, with multiple scrolls creating an immersive experience. The organic nature of her work and the intricacy of detail create a subjective experience that can allude to the microscopic, or the distant cosmos. STREET ART – Los Angeles artist Jason Lockyer has work both inside and outside the gallery. On the facade, one of his animated video shorts will be playing. Audio for the piece will play through speakers mounted to the exterior of the building, creating a surreal experience for Liberty Avenue pedestrians. Along with an animated video inside the gallery, Lockyer will be showing a collection of twenty-one drawings that he created after viewing taxidermy animals in natural history museums. In many of the works, the creatures appear to be alive again, staring back at the viewer. GROTESQUE – Obsessed with bodily functions, or perhaps with using human ailments as metaphors for the problems society, Nathan Margoni’s works are amusingly grotesque. His works for Obsessions include a fourteen by six-foot painting of a diseased foot and a 25 foot long sculpture of the imaginings of the digestive tract! PLANTS & HUMANS – Brooklyn artist Mary Ivy Martin will be showing two video pieces that reveal intimate human-plant interactions. Face Faucet features the artist sustaining potted plants utilizing her own sweat. In Tree Stand, the artist balances a tree strapped to her back. Positioned in place of the ground, the artist tries to provide a solid foundation for a tree that appears to have lost all life. Opening Reception, Friday, November 28th, 2014, 6 PM – 9 PM. Live Music by Pittsburgh marching ensemble, Colonel Eagleburger’s High-Stepping Good-Time Band at 7 PM.